You may be wondering if you should add fertility acupuncture into your IVF and fertility treatment plan. You're already spending ridiculous amounts of money on fertility treatment. Is it really worth the additional cost? In this video, my patient, Kristi, bravely shares her IVF and fertility journey. She had the same hesitations as you about whether to add fertility acupuncture into the mix. But after a ton of research and going with her gut, she decided adding fertility acupuncture as part of her fertility treatment was a no-brainer. Diagnosed with Diminished Ovarian Reserve (DOR), Kristi knows acupuncture made the difference in conceiving her adorable and miraculous son, Rhett. Having the same hesitations you do, Kristi reveals why she chose to get fertility acupuncture and exactly how it helped. "When I was diagnosed with Diminished Ovarian Reserve, it was March of 2011. Right away I thought I need to get on the ball adn give myself the best chance possible. Because I knew I probably only had one chance at this. My AMH was .67 and diagnosis (recommendation) was IVF, hopefully it works. We'll do one round and hopefully have a good response. If not, then maybe we'll move on. I really wanted to put everything I possibly could into this chance, so I really prepared myself. This included acupuncture, supplements and herbs. For 4-5 months before my IVF, I really just focused on that. I included it in my daily regimen. And I think it really helped. I was able to get 10 eggs and 8 fertilized, which resulted in 4 embryos, which for me was a great response because really we were hoping for maybe 1 or 2 embryos! To have 4 good quality embryos, 2 that we could transfer and 2 that we could freeze, was above and beyond of a result for us! I look back on all those months I was doing acupuncture and the supplements I was taking and I really do think that that was directly correlated with it. I felt like I created an environment for my body to produce the best quality eggs that it possibly could. I really think that if I hadn't done acupuncture and I hadn't done the supplements and herb regimen, that I probably wouldn't have had as good of a response. As I was looking for an acupuncturist to help with my fertility as I was preparing for IVF, I wasn't really sure where to go. There's a lot of choices. San Diego is a big town. And so once I met with Heidi and we did our consult, I was immediately put at ease. I really appreciated her attitude and the environment that she created. I felt like it was supportive. I felt like it was loving. I felt like she actually really cared about me and she really was invested in me getting pregnant and wanted to help any way she could. That was really important. I really wanted to go to an acupuncturist that I wasn't just a number. She knew me. She knew my story. She remembered things when I came in every week and would follow up with questions. And that was part of the environment and the atmosphere that I wanted. I didn't just want an acupuncture treatment. I wanted an extra level of support. Because as I moved through my infertility journey and got ready for my IVF, I needed people on my team. I needed people to support me because it was a challenging experience for me. I felt like Heidi was part of my team and she was there to help in any way she could. So when I first started my journey of trying to conceive (TTC), I did not include acupuncture in my experience. But once I really started looking into the research, I realized that I did really need it. I think that there is a lot of examples out there that show that it definitely helps. It helps with relaxation. It helps with increasing blood flow. There's just so much out there. And everybody I talked to that had done acupuncture just raved about it. There really wasn't a single person I'd met that gave me a negative review about doing acupuncture. I started doing acupuncture, and I loved it right away. Immediately it put me at ease. It was a time for me to have self-care. It was time for me to relax. It was time for me to focus on my body. And I really appreciated that it focused on fertility. One way I describe it to my friends who are a little nervous about acupuncture or just a little skeptical about it is by equating it to how I feel about getting a massage. Acupuncture is like that in that it's a way to take care of myself. It's a way to treat my body with respect. It's a way to express gratitude to my body for what I'm asking it to do. And it's a way to give my body the tools that it needs to be as fertile as possible. So for me, acupuncture as part of my fertility journey was definitely the right choice. I really appreciate all the things that it's brought to me emotionally and physically. I definitely saw the changes in my body after I started going to acupuncture. My cycle was always pretty short. It was about 24 days. And then once I started acupuncture regularly and was on the different herbs and supplements, it went up to 26 days, which is a more regular cycle length. And I could see that right away, after the first month or two, which I thought was amazing because it was like proof that I could see on a piece of paper and I thought that was awesome! I also just noticed that I felt like my body was more in rhythm. It was more in tune and it just felt really great. I really credit acupuncture for having a successful IVF (In Vitro Fertilization) cycle. Because I did acupuncture for 4 months before IVF and I did pre and post acupuncture for both my IVF and my Frozen Embryo Transfer (FET) and it was great. It really relaxed me. It put me in a great frame of mind for both transfers. And it just felt like something good I could do for my body and for the embryos and for everything about the situation that really increased fertility in my mind and gave it the best chance I possibly could give it." 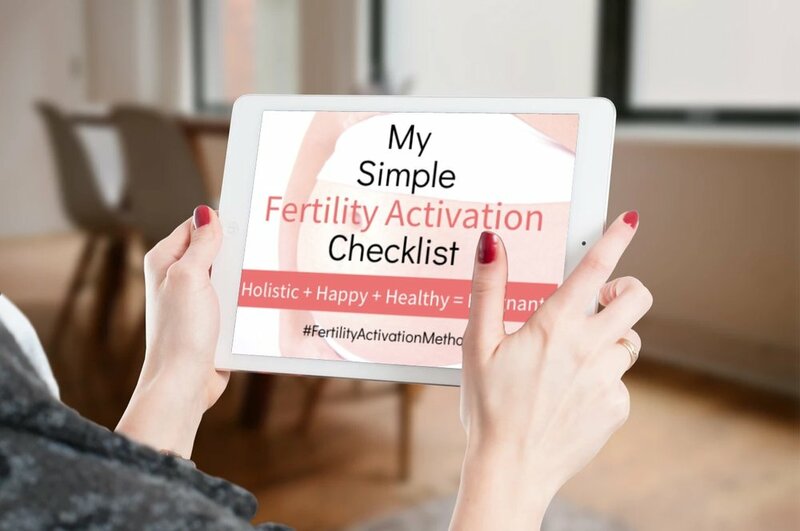 For a free introductory fertility self-acupressure video, supplement recommendations, guided fertility recommendations and more, sign up for access to my Free Fertility Resource Library. Are you fed up with trying to conceive?